Lock in a great price for Da Vinci Eastbourne - rated 8.5 by recent guests. This place is such a great find. Lovely victoriana building, large rooms with big windows fire a great area view and lots of light. It was also very quiet for a great nights sleep. Great location just minutes from the beach and centre. Would definitely stay here again. Superior double room is large, lovely windows. Good water pressure in the shower. Very good location, right by the beach, close to Little Chelsea with good cafes and restaurants, art gallery and hotels. The receptionist was extremely nice and helpful. A nice hotel with good facilities in an excellent location with a large selection of restaurants close by. We had a large family room and modern bathroom. The free on road parking permits were very much appreciated. The breakfast was excellent. The large selection of DVDs to borrow and the DVD player in the room are a great idea. We got much more than what we were expecting...we planned a budget break to Eastbourne but the hotel made it feel like a luxury break...room was clean and had a sea view..breakfast was excellent and was included in price..staff could not be more helpful..we will be returning which says it all doesn’t it? Side, sea view was lovely. Great location, can walk everywhere, no taxi required for us. Hotel was warm, friendly bed very comfortable, fantastic English breakfast cooked how we requested. All staff were helpful and friendly. I arrived early before the stated check in time. This was not a problem. I was allowed leave my bags in my room and returned a little later when the room was fully prepared. Adnan was very helpful and accommodating. The room and en suite were spotless. The room was a good size for a single. There was hairdryer, iron and board in the room. The room was bright and noise free area. Hope to return to this hotel and will recommend to friends. 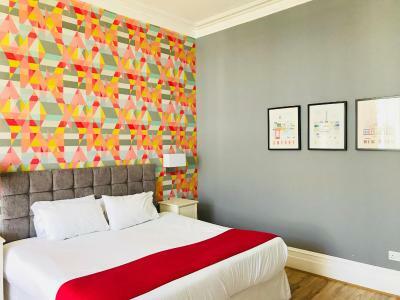 Rooms at the Da Vinci have been designed to celebrate the work of artists ranging from Kandinsky to Monet and Rothko to Klimt. The rooms have all been refurbished and redecorated to a very high standard. In the latest rooms and in the corridors you will find artwork from local, professional artists. On the ground floor there is an art space, a resident's lounge with full licensed facilities, 2 breakfast rooms and a conference room. The Da Vinci is conveniently situated for a variety of local attractions including the new arts centre, parks, gardens, museums and the beach with its sweeping seafront and 3-tier promenade. Da Vinci Eastbourne has been welcoming Booking.com guests since 10 Jun 2008. When would you like to stay at Da Vinci Eastbourne? Rooms each feature a TV and DVD player, tea/coffee making facilities and a modern bathroom with shower and complimentary toiletries. Please note that all single rooms are located on the third floor and set at the back of the hotel, and ground-floor rooms are not available. These rooms are located at the back of the property. Each room features a TV and DVD player, tea/coffee making facilities and a modern bathroom with shower and complimentary toiletries. 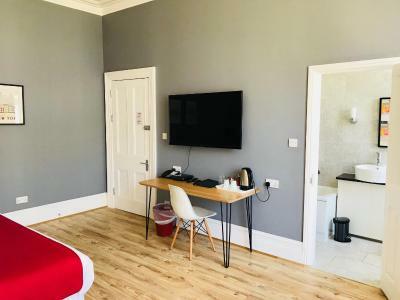 Situated at the front of the hotel and overlooking Howard Square, Superior rooms include a king-size bed and a shower with complimentary toiletries provided. Spacious room includes a super king-size bed and seating area and are situated at the front of the hotel with views of Howard Square. Please specifically request twin/double bed when booking. House rules Da Vinci Eastbourne takes special requests - add in the next step! Bankcard Da Vinci Eastbourne accepts these cards and reserves the right to temporarily hold an amount prior to arrival. Da Vinci Eastbourne accepts these cards and reserves the right to temporarily hold an amount prior to arrival. Complimentary parking permits are provided to all our guests for the duration of their stay. Guests may park anywhere in Zone S which includes parking spaces in the square outside the hotel. Parking spaces cannot be reserved or guaranteed. Baby cots are available upon request and need to be confirmed by the hotel. 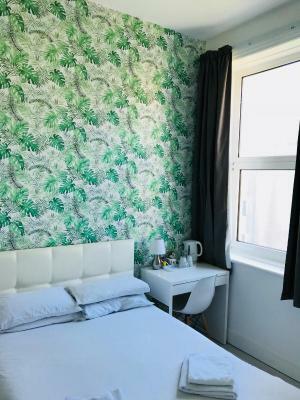 A limited number of twin rooms are available upon request. Please check with the hotel for twin room availability when making the reservation. Hotel is a bit dated but ok. Bed not very comfortable, pillows extremely thin. Annoyed at the bathroom doorknob - very easy to hurt your knuckles! Breakfast ok, although would have liked to have a porridge option and actual fresh fruit rather than from a can. The staff.. particular Adnan.. went and above and beyond. Seemed to be everywhere, very hard working and only too happy to help. Really made the difference. The curtains were rather thin so we all woke up early. Banging doors throughout the night. Clean. Location. Value for money. there should be a hairdryer and slippers in the room please. Outside of building looks weathered but once inside the decor is lovely and bright and feels warm and inviting. Cannot find fault with this property. Would have loved a bowl of fresh fruit as well as the grapefruit segments and prunes that were available. This is a personal choice extra touch.